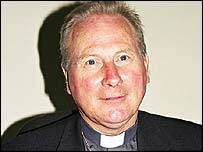 Archbishop Michael Fitzgerald is the president of the Pontifical Council for Interreligious Dialogue. The following is an address he delivered at Trinity College in Washington on October 25, 2003 . "Interreligious dialogue is part of the church's evangelizing mission" (Redemptoris Missio, 56). This statement of Pope John Paul II in his missionary encyclical Redemptoris Missio says it all, and there would be no need to elaborate further. Yet perhaps it is necessary to unwrap this statement by examining what is meant by the terms evangelizing mission and interreligious dialogue and then looking at the relationship between the two. Evangelization, or evangelizing mission, is a very Catholic concept. Other Christian denominations will speak more readily about evangelism, by which they mean the direct preaching of Jesus Christ. The World Council of Churches, for instance, has within its structures a body called the Commission on World Mission and Evangelism. Mission here is taken in a wide sense and includes many activities of the church in the fields of education and health, for example, while evangelism refers to bringing about conversion to Christ. In Catholic circles, as illustrated by the apostolic exhortation of Pope Paul VI Evangelii Nuntiandi, evangelization can have both a narrow and a broad sense. In general evangelization means bringing the good news of Jesus Christ into all areas of humanity, thus transforming it from within (cf. No. 18). This can be done in a variety of ways. One of these ways is "the clear and unambiguous proclamation of the Lord Jesus" (ibid., 22). "This proclamation,'' the same exhortation goes on to say, "occupies such an important place in evangelization that it has often become synonymous with it, yet it is only one aspect of evangelization" (ibid.). The Gospel can be brought to different areas of humanity by the life of the Christian community and by its actions inspired by love. You may think I am laboring this point, but to me it is very important because it means that the Christian way of relating to people who belong to other religions need not be confined to the direct preaching of Jesus Christ to them. Let me quote here the first document produced by the Holy See's office for interreligious relations, "The Attitude of the Church toward Followers of Other Religions: Reflections and Orientations on Dialogue and Mission " (abbreviated "Dialogue and Mission "), which was published in 1984. It describes mission as a "single but complex and articulated reality." It enumerates its principal elements: "the simple presence and witness of the Christian life ..... the service of mankind and all forms of activity for social development and for the struggle against poverty and the structures that produce it. Also, there is liturgical life and that of prayer and contemplation.... There is also the dialogue in which Christians meet the followers of other religions in order to walk together toward truth and to work together in projects of common concern. Finally, there is announcement and catechesis in which the good news of the Gospel is proclaimed and its consequences for life and culture are analyzed'' (No. 13). Perhaps not all elements are listed; mention could have been made of ecumenical dialogue as an essential activity of the church and also dialogue with people who have no religion. What is important to notice is that these different elements are lived out for themselves, and not for any ulterior purpose. In other words, they are not to be seen as being in function of conversion to Christ. Presence and witness is already a way of practicing mission (and indeed this would be the way the Orthodox churches see mission). Yet this presence and witness, to be authentic, has to be accompanied by prayer, both liturgical and non-liturgical. In the liturgy we proclaim Jesus Christ yet we do not celebrate the liturgy in order to draw people to the church. Of course the liturgy may be, and should be, attractive, and so may arouse interest among people who are not Christians who happen to be present, yet this is not its true purpose. The liturgy is celebrated to give glory to God. Similarly the service which the church offers in the fields of education, health and care of all kinds may also draw people to the Catholic fold, yet again this is not its immediate aim. The church has to engage in social action in order to express Gods love for humankind, since the church, by nature, is a sacrament of this divine love. So also dialogue should not be seen purely as a means to bring about conversions to Christianity; this would be too narrow a view and would lead to dialogue being treated with suspicion by people of other religions. Dialogue can be taken as a way of reflecting God's love for all people, a love which respects their liberty. Thus the finally in the paragraph quoted above is not to be taken in the order of intention, as if all the first-mentioned elements of presence, prayer, service and dialogue were finalized by the direct proclamation of Jesus Christ, but rather as simply indicating the last in a list. As John Paul II wrote in Redemptoris Missio: "Dialogue does not originate from tactical concern or self-interest, but is an activity with its own guiding principles, requirements and dignity" (No. 56). And again: "In the light of the economy of salvation, the church sees no conflict between proclaiming Christ and engaging in interreligious dialogue. Instead, she feels the need to link the two in the context of her mission ad gentes. These two elements must maintain both the intimate connection and their distinctiveness; therefore they should not be confused, manipulated or regarded as identical as though they were interchangeable" (No. 55). If dialogue is not geared to conversion to Christ, what is its purpose? Perhaps here too one could speak about something that is multifaceted. There is not just one purpose of dialogue but rather a number of aims. There is first the aim of helping people of different religions to live together in peace and harmony. This is a task which is ever more urgent in a world becoming increasingly multicultural and multireligious. It is a task which implies, as we know, overcoming prejudices, battling against indifference, creating understanding. This first level of dialogue should not be lightly dismissed. Can it not be taken as an anticipation of that peace which we know will reign in the next world? It is therefore already a way of bringing about God's kingdom. A further step in dialogue is to work together in the service of humankind. The problems with which our world is faced are so great that there is need of the efforts of all to thee up to them. Religions can help in providing motivation to reach out to those who are in need, to strive for a more equitable division of the world's resources, to ensure that while natural resources are exploited the environment is protected. There are not only Christian bodies engaged in these different fields, but also Islamic humanitarian organizations and movements of concerned Buddhists. There is room therefore for such religious organizations to cooperate. Here again this can be seen as a contribution to the building up of the kingdom of God , which is a kingdom of justice, freedom and peace. Yet dialogue can go still further. A later document, "Dialogue and Proclamation'' from 1991, notes that it may take the form of a sharing of spiritual values, a mutual witness to beliefs, an exploration of the riches of the respective spiritual traditions. In this way Christians and people of other religious traditions can help one another to deepen their religious commitment, to respond with greater sincerity to God's call (cf. No. 40). A text already quoted characterizes dialogue as a process in which Christians and people of other religious traditions "walk together toward the truth" ("Dialogue and Mission ," 13). It might be objected here that Christians already have the truth. Did not Jesus say, "I am the way, the truth and the life"? If this is so, how can we who believe in Christ still be in search of the truth? To this objection the document "Dialogue and Proclamation" responds in the following way: "The fullness of truth received in Jesus Christ does not give individual Christians the guarantee that they have grasped that truth fully. In the last analysis truth is not a thing we possess, but a Person by whom we must allow ourselves to be possessed. This is an unending process. While keeping their identity intact, Christians must be prepared to learn and receive from and through others the positive values of their traditions" ("Dialogue and Proclamation," 49). It would not be an exaggeration to say that it is belief in the Trinity that urges Christians to engage in dialogue. Through revelation we have come to know God as a Trinity of Persons among whom there is constant interchange and perfect communion. This provides a lofty model for our relations with our fellow human beings, relations which are to be imbued with respect for the identity of each person and at the same time a strong desire to achieve communion. We can go further and see in the relations attributed to each of the divine Persons an incentive to engage in dialogue with all. Thus in the Father "we contemplate a pervasive love unlimited by space and time" ("Dialogue and Mission ," 22). What does this mean? It means that we can discover, like flowers in a barren desert, signs of God's love in all peoples. No people can be excluded from this all-embracing love. It means moreover that at all times God's love has been made manifest in different ways. It is extremely important to remember this, especially when encountering people who have a great attachment to their ancestors. Would it not be horrific to say to them, "Your ancestors are all condemned because they did not know Christ"? Surely we should rather encourage them, possibly by quoting Paul's words to the Athenians: "Yet in fact he (God) is not far from any of us, since it is in him that we live, and move, and exist, as indeed some of your own writers have said: 'We are all his children''' (Acts 17:27-28). The mission of the second Person of the Trinity also provides a basis for dialogue, for the Word made flesh in Jesus Christ is in a mysterious way united with each member of the human race. In the light of our faith, we encounter Christ in every person. This way of perceiving humanity has consequences for social behavior, the way we treat people, for human dignity is enhanced by the fact of the incarnation. It also has consequences for the way in which we dialogue with people. They must be approached with great respect. Finally the action of the Spirit is an incentive to dialogue. This action, as John Paul II has said in his encyclical Dominum et Vivificantem, "has been exercised in every place and at every time, indeed in every individual" (No. 53). In other words, the action of the Spirit cannot be confined, just as the Spirit was at work in the world before the first coming of Jesus, so this same Spirit is at work outside the visible boundaries of the church that Jesus founded. Moreover "the Spirit's presence and activity affect not only individuals but also society and history, peoples, cultures and religions" (Redemptoris Missio, 28). This is of extreme importance for dialogue, for it means that we cannot go to people of other religions as if we had everything and they had nothing. The Spirit has gone ahead of us, and so we can meet the Spirit in them. Everything that is good, noble and beautiful in their rites and traditions is to be welcomed with respect and gratitude. In this way dialogue becomes a journey of discovery and can provide an opportunity for mutual enrichment. Perhaps a further word should be said here. We believe firmly that God wills the salvation of all, and we know, by faith, that for this purpose God sent his Son into the world so that through his passion, death and resurrection the world might be saved from sin. This universal will of salvation surely implies that God must provide the means for people to be saved. This is why the Second Vatican Council, in Gaudium et Spes, the Constitution on the Church in the Modern World, teaches that "since Christ died for all (cf. Rom. 8:32), and since all men are called in fact to one and the same destiny, which is divine, we must hold that the Holy Spirit offers to all the possibility of being made partners, in a way known to God, in the paschal mystery" (No. 22). The way is known to God, but can we inquire as to what this way might be? Are there elements in the different religions which help people to enter into the paschal mystery? There are indeed methods of prayer, ethical rules, rites and practices which encourage death to oneself in order to live for others, which is a practical way of understanding "entering into the paschal mystery." Of course, to lead a life of self-sacrifice, of virtue, divine grace is needed, grace which is itself a fruit of the work of redemption in Christ, even though the person who is living in this way may not be aware of the origin of the grace and the relation to Christ. It is necessary to be careful here. What has just been said should not be understood as if it implied that other religions are ways of salvation. Our Christian faith teaches us that there is only one Savior, Jesus Christ. We cannot say that all religions are equal and that it does not matter to which religion one belongs. Nor can we say that these religions are perfect, for they contain shadows as well as luminous qualities. What can be affirmed is that elements of grace which can help people on the way of salvation can be discerned in different religious traditions. If what has just been presented on the theological foundations for dialogue is sound doctrine -- and it has been based on the teaching of the Vatican Council as it has been interpreted and developed by the present pope -- a question naturally arises. If people can be saved within their own religious traditions, why should the church engage in missionary activity? Is it not better to leave people where they are? At most, should it not be our aim to make Muslims better Muslims, Buddhists better Buddhists and so on? This question has, in fact, already been answered by the reference to Redemptoris Missio, where John Paul II says that proclaiming Christ and engaging in interreligious dialogue are distinct elements of the church's overall mission. They are by no means interchangeable. I cannot say that the time of proclamation is over and that it must give way to dialogue. The church must always remain faithful to the Lord's command to preach the Gospel and to invite people to accept baptism and become members of the community of believers. This proclamation springs from love. "The love of Christ impels us," says St. Paul . It is because we have come to know and value the Lord Jesus, and because we appreciate all that God has done for us in him that we wish to share this good news with others. This desire that others may come to know Christ, may be captivated by the beauty of the person of Jesus, will be in the hearts of Christians who engage in dialogue. It is this that will give strength to their testimony when they are called upon to give an account of the hope that is within them. It will be a question of discernment when the good news can be preached explicitly, including the invitation to accept Jesus as Lord and Savior with all the consequences of such an acceptation. Perhaps it is good to say a word about the way in which this preaching should be carried out, the qualities which should characterize the church's proclamation. The document "Dialogue and Proclamation" notes six qualities (cf. No. 70). It starts with confidence in the Spirit, the prime evangelizer. It lists fidelity in the transmission of the message received from Christ and handed on by the church. It says that proclamation should be humble, for what we are dealing with is a gift which has been received without merit; moreover the messengers of the Gospel do not always fully live up to its demands. It is stated that there must be respect for those to whom the proclamation of the good news is being addressed, for the Spirit is already at work in them. The proclamation needs to be "dialogical," in other words it needs to take into account that the "hearers of the word" are not just passive receivers. Similarly the message must be inculturated, that is, it must be presented not only in an intelligible way but also as something which corresponds to people's deepest aspirations. It is readily understood that the message of the Gospel should never be imposed, but always proposed. At the end of this reflection it would be good to ask about who is called to engage in dialogue (and perhaps the same could be said about proclamation). Here again I should like to quote some words of John Paul II. "Each member of the faithful and all Christian communities are called to practice dialogue, though not always to the same degree or in the same way" (Redemptoris Missio, 57). This is important. Dialogue cannot be considered as an optional extra. If in the human community there are to be found people who belong to different religious traditions, then the members of the Christian community have the duty of reaching out to them. The Spirit will indicate whether this is to be done through proclamation or through dialogue. Indeed, one and the same person, one and the same community, can be engaged in both these activities. There may be people from a Muslim background who are joining the catechumenate and therefore the Gospel is being preached to them directly. Yet there may be other Muslims, the majority probably, who show no sign of wanting to become Christians, and so with them the furthest that one can go will be to engage in dialogue, that is to establish good, friendly relations. It is also important to recognize that the ways of engaging in dialogue may differ. For some it may be the rather informal fostering of a spirit of neighborliness. For others it may entail cooperation in some joint project. Others may engage in formal discussions with people of other religions, whether about matters of belief or questions of social concern. Still others may be drawn to seek ways of praying together with their Muslim, Buddhist or Hindu friends. It is good that the gifts of each be recognized. No one way of dialogue should be considered exclusive. John Paul II, after the sentence quoted above, went on to say, "The contribution of the laity is indispensable in this area" (Redemptoris Missio, 57). He spelled this out in two ways: the example which lay people can give, and the contribution they can make through research and study. Perhaps the engagement of the laity in the task of dialogue has to be stimulated further. "Christians must always be aware of the influence of the Holy Spirit and be prepared to follow wherever in God's providence and design the Spirit is leading them. It is the Spirit who is guiding the evangelizing mission of the church. It belongs to the Spirit to inspire both the church's proclamation and the obedience of faith. It is for us to be attentive to the promptings of the Spirit. Whether proclamation be possible or not, the church pursues her mission in full respect for freedom, through interreligious dialogue and witnessing to and sharing Gospel values. In this way the partners in dialogue proceed in response to the divine call of which they are conscious. All, both Christians and the followers of other religious traditions, are invited by God to enter in the mystery of his patience, as human beings seek his light and truth. Only God knows the times and stages of the fulfillment of this long human quest" (No. 84).